Today we’re sharing another fun Halloween drink for kids! This time, it’s a spin on the classic Poison Apple from Snow White. Except, of course, it won’t make your kids sleep until some stranger comes to kiss them! That would just be creepy! I love this particular Halloween drink for kids because it’s really like two drink recipes in one. First, you’ll be making your own cider. Yum, right? Then, we’ll tell you how to blend it together to create the Poison Apple drink! Have you ever made your own apple cider? Do you have any favorite Halloween drink recipes for kids? Share in the comments! -Put all into a large pot. Add spices. -Cover with water bringing to a boil. Continue to boil uncovered for 1 hour. -Cover. Simmering for 2 hours. -Using a potato masher roughly mash all ingredients. -Continue to simmer until cider is dark tasting sweet and spicy. Allow to cool. -Strain everything into a large pot. -Pour apple cider and ginger ale into a pitcher. Stir to combine. -Add ice to a glass. 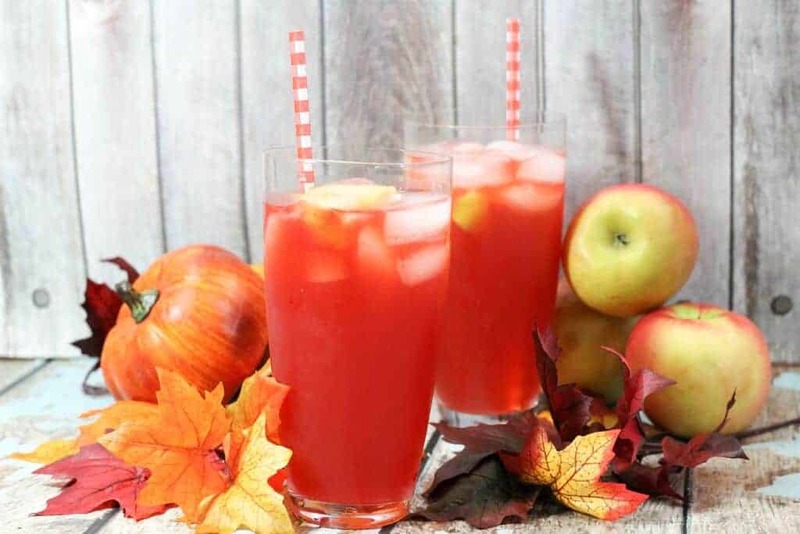 -Pour apple cider and cranberry juice combination into the glass. Try serving this fun Halloween drink recipe for kids in festive seasonal glasses! This goes great with our Screaming Orange Halloween Cupcakes! If you don’t have time (or the desire) to make your own cider, it’s okay to use pre-made apple cider. While you can get this in any grocery store during the Halloween season, I highly suggest checking out your local farmer’s market. They often have amazing apple cider made from fresh, local apples. Plus I just like supporting my area’s farmers. You can make the apple cider a day or two ahead of your party, just don’t make it too far ahead. If you’ve ever had apple cider, either from a store or that you’ve made on your own, you know that after a few days of sitting it can get a bit cloudy and, well, just a bit funky. Let it go TOO long and you’ve got yourself a bona fide “poison” apple Halloween drink! Not exactly what we’re going for here, now is it? As far as the types of apples go, a mix of different types makes the best cider. Each variety of apple has its own unique properties that, when blended together, create a perfectly balanced apple cider will please picky taste buds. You don’t want to go with all one variety because you could end up with cider that’s too sweet or too tart. Got leftover oranges? 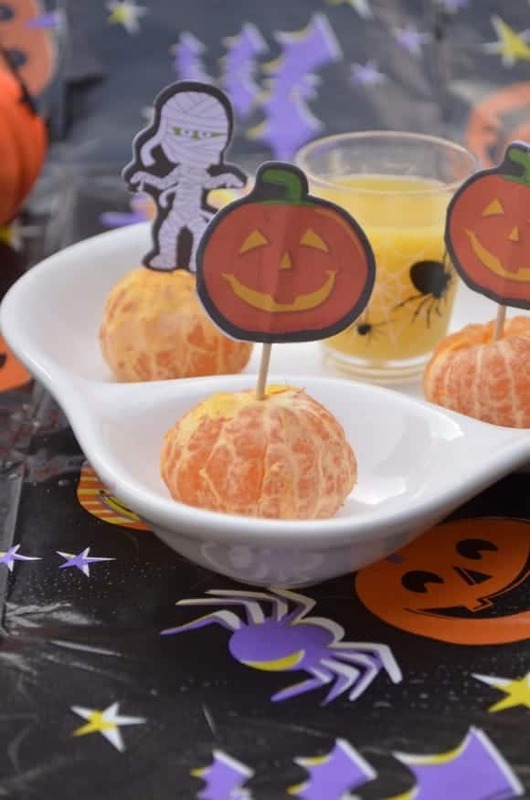 Try making this super easy and fun healthy Halloween Orange Brains treat for kids! The drink is delicious.I tried it and my kids love it.I want to thank you for this Informative and interesting blog. I may be missing something but where does the ginger ale come in? It’s not in the ingredients but it says to mix it with the cider. I’m really excited to make this so I want to make sure I’m doing it right! Sounds like so much fun for kiddos and looks yummy too! Thanks for sharing at the #HomeMattersParty – hope to see you again next week. I’ve never made homemade apple cider before but it looks delicious. This is perfect for a kids Halloween party. Looks delicous, I’m sure my kids would really enjoy. I love apple cider. I could have it all year round! This would be a refreshing drink to serve for Halloween parties. That looks refreshing and delicious. I can’t wait to try this. I like the cranberry in this drink. 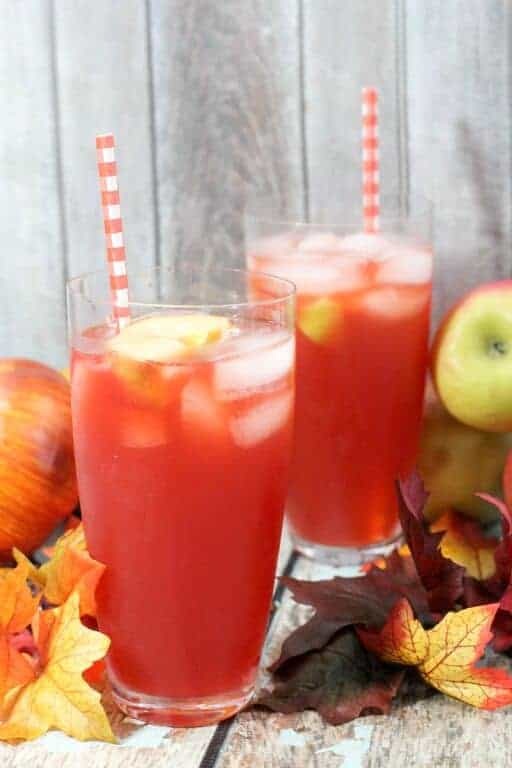 It sounds fall-ish but yet super refreshing! I love homemade apple cider. It is the perfect treat to enjoy during this spooky season leading up to Halloween. Homemade cider is so delicious! This would definitely be a hit at any Halloween party! Yum. I need to try this with my kiddos. How fun. We’ve never really done anything like this before for Halloween and I think my kids would have fun with this! Sounds pretty delicious too! This is a great drink mix! I love your cute Halloween ideas- I will need to put these together for our Halloween play date! CUTE idea! My boys would love this. I think I Might try it. This is great! I am definitely making something like this for Halloween! My daughter will love it! Yum! I love that you kept this healthy! Great recipe!